When boxing fans hear the moniker “The Golden Boy,” they of course think of Oscar De La Hoya, but some four decades before Oscar became one of the biggest draws in boxing, there was the first “Golden Boy,” a boxer named Art Aragon and he was every bit as popular in his time as Oscar was in his. A huge draw on the west coast, Aragon was a perpetual headliner at the Olympic Auditorium in Los Angeles and also for dozens of matches at the Legion Stadium in Hollywood. 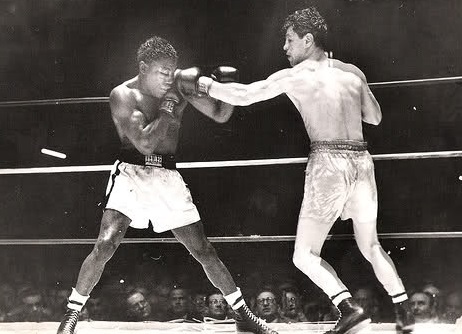 He already had a solid record with some 40 wins when he stopped popular Mexican slugger Enrique Bolanos in February of 1950. He repeated the feat five months later, this time beating “The Durango Dropper” with ease, and instantly he became a guaranteed ticket-seller. 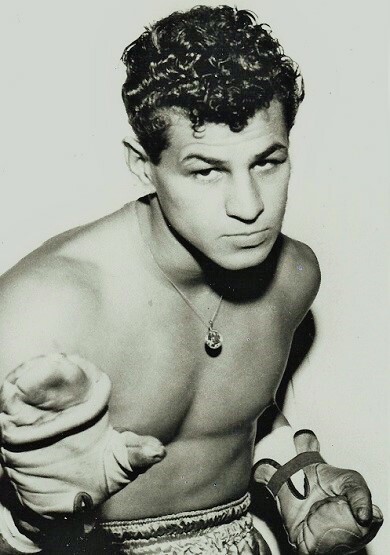 He was the boxer Mexican fight fans loved to hate while Americans appreciated his aggressive, all-action style. And the female contingent was attracted to his good looks and flamboyant ways. Mamie Van Doren was one of Aragon’s admirers. 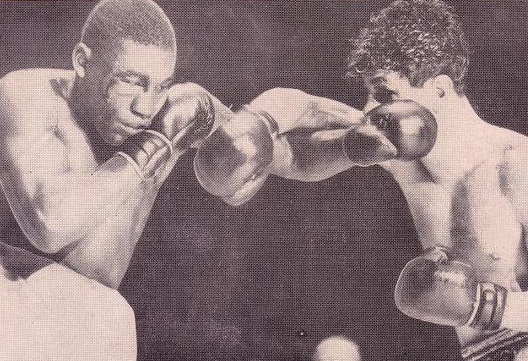 As the story goes, when he weighed in for his 1958 match with Carmen Basilio (Basilio stopped Aragon in eight), he was asked how he was doing. “Not so good,” said Aragon. 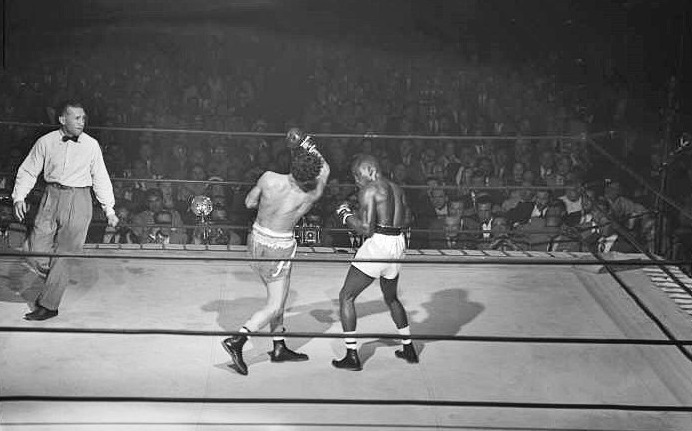 “Both my wife and my girlfriend are here.” He relished the spotlight and all the admirers and in August of ’51 there was a huge crowd at the Olympic Auditorium when he faced world lightweight champ Jimmy Carter and beat him by split decision. Aragon upsets Carter in their first match. But it was a non-title fight and thus Carter vs Aragon II with the championship on the line became an even bigger attraction. This would be Aragon’s one and only title shot and both his fans and detractors were excited by the prospect of seeing him fight for the lightweight crown. But the Jimmy Carter who appeared somewhat lethargic in August was a sharper and more focused pugilist in November. Aragon and Carter weigh in. Carter, who defeated Ike Williams for the title, was a talented boxer but he was widely viewed as a mob-controlled one. His loss to Aragon was not the first time he performed poorly when the odds were stacked in his favour and now those who had cashed in on the underdog in the first fight could cash in again on the rematch. But Aragon did not go gently into the night. 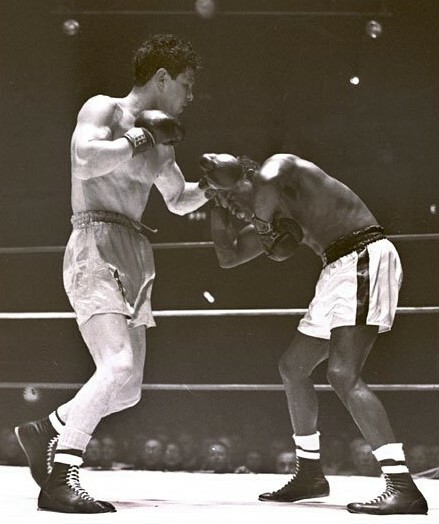 He was the better man in the early going, making the fight and landing plenty of solid shots, rocking Carter more than once with his left hook. But the bout turned in round six when Carter caught Aragon coming in, blasting him with a left hook of his own and sending “The Golden Boy” to the canvas. Aragon beat the count but now he had a bad cut over his left eye and Carter took over, winning round after round. Still, the crowd got its money’s worth. There was plenty of action and in the late going Aragon showed his grit and guts, refusing to surrender and taking a beating in the last few rounds. In the final stanza Carter scored a second knockdown but then showed mercy, easing off and letting the clock run out. The scorecards were wide: two had Carter the winner by 11 points, a third by 12. It was a humbling defeat but Aragon was not a humble man and he had proven again he was both tough and game. The loss did nothing to effect his ability to sell tickets in Southern California and so he battled on. Aragon was game but Carter was the better man this night.